Once again, Microsoft has shown that it does not shy away from anti-competitive practices. They are making this a habit. It’s loud. And it’s clear. Users do not want to be stripped of their ability to make a choice. And in no time, many more echoed his sentiment. The public outcry was immense and can be seen in the above thread. This is yet another unfortunate example of Microsoft abusing its monopoly power. It has been trying for years to direct users to its own browser, going so far as to add annoying pop-ups and prompts that divert users to keep using Edge when they use any other browser. They have also made it hard for users to change the default browser, which was a lot easier before. Now Microsoft is trying to redirect users before they’ve even installed a new browser. I was asked by CNET about this latest move. Without a doubt, I feel that Microsoft does not seem to have learned from its earlier mistakes. They are gradually getting worse as they are not being checked. It was only earlier this year, in April, that users complained that Microsoft’s latest update was employing tricks to set Edge as the default browser. The truth is that users cannot be won through strong-arm tactics – tactics used not only by Microsoft, but others as well. We need to drive the technology industry with responsibility and put user choice first. Want more users to adopt your products? Build better products. Give users the choice. Let them browse the way they want to. This is the only way. 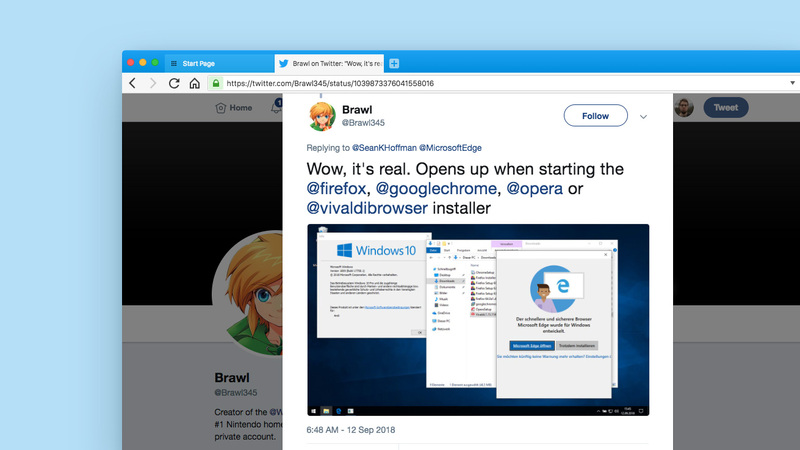 At Vivaldi, we want more and more users to try out our browser and enjoy it. We believe in winning users on our merit and not by spamming them or employing tricks.